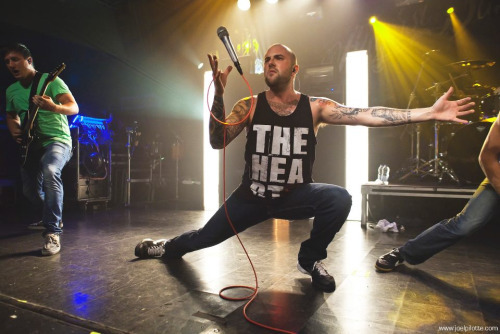 Forming in 2003, August Burns Red exploded into the scene with a fierce progressive sound, mixed with guitar guided melodies, compiled with the filthy unclean anthems of vocalist Jake Luhrs. 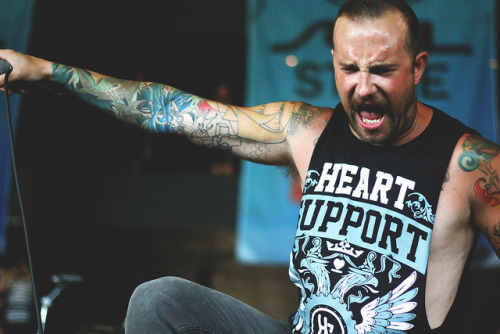 This is part 2 of our interview with August Burns Red vocalist Jake Luhrs. You can read part 1 about Heart Support here. Enjoy! Josiah: Do you have a pre-concert routine? Jake: I mean, I go to the gym every day pretty much. That’s not necessarily for the show, I just want to stay fit so that I can preform to the best of my abilities. But I would say most of my routine is hot tea, prayer, kind of warming up and stretching some while getting focused and ready for the show mentally. Nathaniel: I’m going to ask you five questions in a row and whatever comes to your mind first answer with that okay? Nathaniel: Which actor would you let play in the movie about ABR? Nathaniel: Who is the best cook in the band? Nathaniel: If you had to choose one band to tour with dead or alive what would it be? Jake: Ooh, a puppy. Any kind of puppy. Nathaniel: What are you listening to right now? Josiah: Oh man, he’s my favorite too. Josiah: On your new album you have a collab with Jeremy McKinnon, tell us how that came about. Jake: Basically we were sitting in the studio kind of talking about guest vocals and if we would have guest vocals on any of the tracks. So they asked if there was anyone we would like to sing on the record, and to be honest with you, the only guy in our industry that I really respect and that I think has a very good voice is Jeremy Mckinnon. And they were like, well you guys are friends why don’t you give him a ring and see if he would be interested? So I said alright and I gave him a ring and asked if he would want to do guest vocals on one of the tracks. He was actually really excited about it and really pumped. I respect him as a lyricist and an artist so I gave him the lyrics we had written and let him know our idea and subject matter. I told him that it was about the homeless, but that I would like for him to write his lyrics to implement in the song so that kids can actually get all of you on this track. So he spent about a few weeks with the lyrics and the patterns and he recorded it in his studio and when he sent it over to us it was perfect. We didn’t really ask him to change anything. I feel like overall it really adds diversity to the song and also to the record, so I’m very well pleased with it. I mean, he is such a great guy so it’s really nice to have someone like him on the record. Josiah: It sounds incredible. Is that going to open the door for more collabs with him or anyone else in the future? Even though you don’t respect anyone else in the industry (laughs). Jake: (laughs) No! I mean singing wise. I’m not a huge fan of singing and screaming, but I think he pulls it off really well. I’m sure we’ll do some collaborations down the road. I’ve definitely done my part, I’ve been with Bless the Fall on their track “Carry On”, that was a lot of fun.. I did guest vocals with Mattie Montgomery from For Today for one of their records. It’s always fun to be asked and I think it’s a treat for our fans when you have someone else on your record. Nathaniel: How do you guys maintain the creativity you have after ten plus years? Jake: It’s a progression. You’d hope musicians would want to continue to grow. I think our music grows with us as we grow as people so it’s always going to have a little bit of a different twist or turn than the previous record. People grow a lot in two years, which is what I’ve realized. So every record has definitely matured from the previous one. We really take pride in pushing ourselves, pushing the limits.. really testing our abilities as musicians. One of our slogans for ABR is “We want to lead the industry, we don’t want to follow it.” That’s what we expect from ourselves and each other as musicians. We’ve been around for a long time and so we are starting to really understand how we process and how we work.. some of our weaknesses and some of our strengths. We’re very much understanding of each other as musicians and as a body. There’s not one person that really controls the whole ship, JB is the main songwriter, but everyone has their hands in the cookie jar when it comes to creativity and that’s important for us. Josiah: What is it like to have the arsenal that you have? You have one of the most talented group of musicians ever assembled and you might be the greatest dirty vocalist of all time. When you’re in the studios recording, do you guys realize there is pretty much nothing you can’t do? Jake: Thank you so much for such high regard. I wouldn’t look at us like that.. like I said we challenge ourselves. We always look at it as we could always do better. We’re not the best of the best. I think that’s healthy place for us to be. I think once you think of yourself as the best you start to become a little ‘lax towards pursuing something greater than where you are. The process is like a staircase and we’re on a set of stairs and we can go up or we can go down if we choose to do so. It’s nice to know we all take this very seriously. It is a job and it is a career, our pride and joy, and everybody is willing to step up. I don’t think there is ever a moment where we say, hey we’re the best of the best so let’s stop trying. Josiah: What’s your favorite song to play? Jake: Off the new record, “Found in Far Away Places”, Martyr. It’s pretty catchy I think, relatively easy for people and fans to digest. Some of our music is technical, so some of our fans when we play the more technical songs tend to stand and watch and listen. With Martyr, it gives fans and us room to jump around and have fun.. absorb a very simple, easy song to digest. Josiah: Are you ever going to play “Crusades” live? It’s a personal favorite. Jake: No, I’m sorry man. I wish, I really enjoy that song as well. We have so many songs now it’s really hard to get the older ones like that out. Sorry dude. Nathaniel: I was able to watch you guys on Warped Tour in Pittsburgh this past year and seen you several times before. Can you tell me about the progression of your mic swinging and dancing on stage? Were you scared to do it at first? Have you ever hit anybody? Jake: I’ve been swinging the microphone since I was seventeen so that’s been around forever. The dancing is just something that I enjoy doing. There’s some parts in our songs that don’t lend any vocals and they’re kind of dancey and jumpy so I just have fun with it. The moment that artists aren’t having fun, then they’re kind of putting it more as a job rather than enjoying what they do for work. It’s just an opportunity for me to be silly and jump around and have a good time. Some people think seeing a dude like me jumping around like that is silly. It’s not about them at that point or in that moment, it’s about me taking joy in my life and what I’ve created. Josiah: What is one thing you want to do at a show that you haven’t yet attempted? Maybe something we might see on the upcoming tour. Jake: I would like to have a cable long enough for me to jump and crowd surf all the way to the back of the room for an entire song and then have the crowd bring me all the way back to the stage. Josiah: They make wireless mics. Jake: I don’t like wireless. They’re no fun, there’s cable involved so there’s no swinging. Nathaniel: You could attach your mic to a rope like the lead singer from Emery. Jake: Then it wouldn’t be my own thing! Nathaniel: Where did your alter ego Todd come from? Jake: I think we were in the van. It was around 2010, maybe 2011. We were just really, really bored. I think I just created him out of absolutely thin air just to make us laugh and be silly. We spend hours and hours in that van. After an eight hour drive you go insane. I think Todd Lucifer Clemens was birthed out of one of those insane moments and he stuck around, people liked him. I keep him in my back pocket. Josiah: You can find Todd on any of their social media. Nathaniel: Tell us about your upcoming tour. Jake: We have a headliner int the States. It starts November 27th in Philadelphia and then it ends in Lancaster on December 20th. We are taking out our good friends Every Time I Die and Stick to Your Guns. A newer band that I haven’t heard, but have heard great things about called Polyphia. And then a new Fearless Record band called Wage War, they’re apparently pretty heavy and aggressive as well. Nathaniel: Awesome! Is there any new news with touring or writing music from you guys? Jake: We do have a Christmas song coming out pretty soon. We also did a Christmas photo shoot so hopefully our fans will be getting a Happy Holidays card from us via the internet. No new stuff with touring or music writing. Nathaniel: Is this a Christmas calendar you guys shot? Like a naughty or nice thing? Jake:(laughing) No, but that’s a good idea, maybe we will have to try that next year. Nathaniel: Thanks for your time Jake! Follow August Burns Red on Facebook and Twitter! This entry was posted in augustburnsred, Christianity, metal, metalcore. Bookmark the permalink.